Viernes, 28 de junio: Travis Scott, Lana Del Rey, Eric Prydz, Billie Eilish, Brockhampton, The Hellacopters, Lil Baby, Norlie & KHV, Hurula, Halestorm, Molly Sandén, Maya Jane Coles, Alma, Yungblud, Junior Brielle, Lamix, Imenella, Kungs, Brohug, Valentino Khan, Sandra Mosh, Josefin y Steerner. Sábado, 29 de junio: Foo Fighters, Laleh, Bring Me The Horizon, The 1975, Greta Van Fleet, HOV1, The Hives, Alan Walker, Sheck Wes, Mike Perry, Rebecca & Fiona, Masego, Denzel Curry, IAMDDB, Dean Lewis, Bassjackers, Markus Krunegard, Loud Luxury, Off The Meds, Sylvain Armands, Ehrling, Frank Carter & The Rattlesnakes y Gunn. Domingo, 30 de junio: Chance The Rapper, Lil Uzi Vert, Lykke Li, Perry Farrell’s Kind Heaven Orchestra, Young Thug, MØ, Jacob Banks, Wolfmother, Tove Styrke, Mares, Honne, Lemaitre, Felix Jaehn, Chevelle, Smith & Thell, Sebjak, Becky and the Birds y Toomanylefthands. 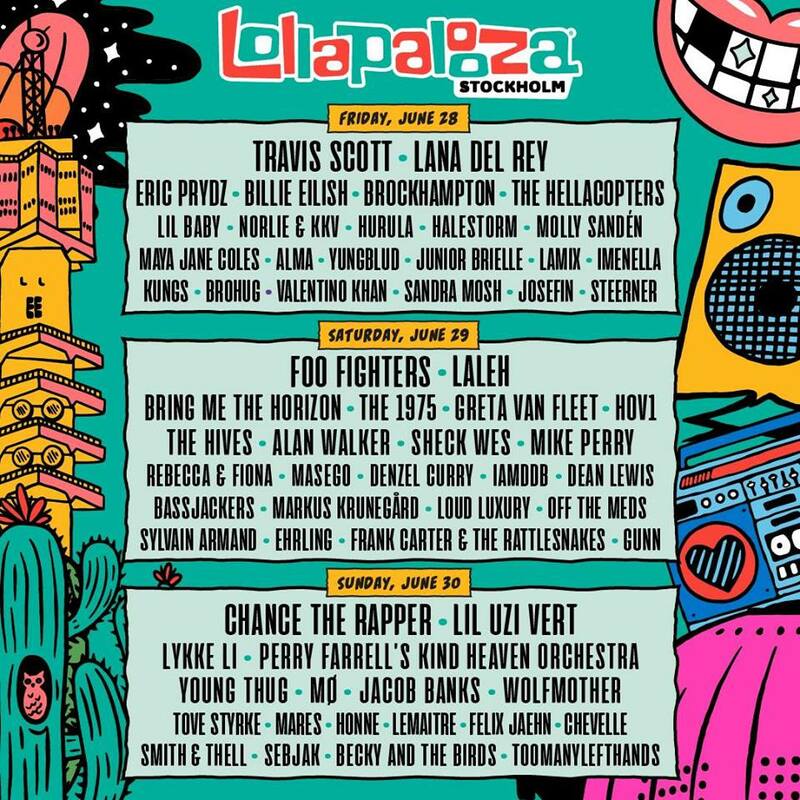 El Lollapalooza Estocolmo se celebrará los días 28, 29 y 30 de junio de 2019 en Gärdet (Estocolmo). Más información aquí.